It’s 70 years to the week since John Maynard Keynes died. And with 70 years gone, the copyright on all Keynes works has now expired. Keynes is the most famous and influential mainstream economist ever. And he has bred a whole school or wing of economics called Keynesianism. And 70 years later, Keynesianism continues to drive the economic thinking on the left of the labour movement internationally. That was revealed again only this month by the latest lecture in the UK Labour opposition series of New Economics seminars – this time by Paul Mason. Mason presented a set of economic policies entirely in line with the views of the current left-wing leadership, including government spending for investment, keeping the central bank independent of democratic control and a people’s bank for investment funded by printing money. Indeed, Mason favoured funding the private capitalist sector to boost investment rather than by direct government spending; “And in a highly marketised economy, targeted money drops into the private sector can actually shape the structural reforms we need better than targeted changes in state spending.” So the capitalist mode of production is not to be replaced, but instead, we must look for ways to make it work better. Keynesian economics and policy options still rule some 70 years later, even among ostensible Marxists. To remember Keynes’ 70th birthday, some other Keynesians recently reminded readers of the British Guardian newspaper (that bastion of Keynesian economic thought) that in 1944, a year or so before Keynes died, he had led the British negotiating team in reaching an agreement with the Americans and others on setting up a new world economic order after the end of the war. That came to be called the Bretton Woods agreement. But is Bretton Woods an example of the way to achieve this world order and can it be done when the very process of capitalism is one of competition and rivalry between imperialist economic powers? I’m afraid that this sort of utopianism is what we often get from Keynesians. It was expressed in Mason’s contribution and that of Joseph Stiglitz in a previous lecture in Labour’s New Economics series. So not so great then. But the authors are also disingenuous. Keynes did not lead the British delegation at Bretton Woods to achieve more equality and greater cooperation among major economies for the benefit of all, including the poor nations of the post-war world. He went there to ensure that British capital’s national interests were protected in a new world where America would rule. As Keynes’ biographer, Robert Skidelsky, pointed out, Keynes’ aim was to get the best deal for Britain, as a major borrower of capital funds, from America, as the major lender of capital. “The British wanted a scheme that enabled them to borrow without strings, the Americans one which would lend with strings. Keynes presented the debtors perspective and White (American negotiator) the creditors”. P671 Skidelsky describes the Bretton Woods negotiations as a grab for American funds: “what the delegates did understand was that there was a cache of American dollars available and they wanted as much as possible for themselves” p764. Yes, very idealistic. Skidelsky sums up the outcome. Naturally, the Americans got their way because of their economic power. Britain gave up its right to control the currencies of its former empire, whose economies now came under the control of the dollar, not sterling (p817). In return, the Brits got credit to survive – but with interest charged. Keynes told the British parliament that the deal was not “an assertion of American power but a reasonable compromise between two great nations with the same goals; to restore a liberal world economy”. P819. In other words, the capitalist economy. The other nations were ignored, of course. Bretton Woods was no Keynesian success story but a benchmark for American imperialist hegemony. America established its economic rule at Bretton Woods. The dollar was fixed to gold and became the world’s dominant currency for trade and credit. To control the new world economic order, the IMF and the World Bank were set up under American control and housed in Washington. American dollar capital poured into Europe (Marshall Plan) and Japan in order to restore capitalist industry there, so that these war-destroyed economies could buy American exports in dollars. But Bretton Woods did not save world capitalism indefinitely. The agreement with its fixed exchange rates, dollar supremacy and international institutions run by the US appeared to work during the Golden Age of 1946-65 mainly because the profitability of American capital after the war was very high, and also rose quickly in Europe and Japan, with its cheap surplus labour and new American technology. America’s economic hegemony began to slip as its relative trade and growth superiority slid from the mid-1960s onwards in the face of the cost of the Vietnam war, and Franco-German and Japanese trade success. When the US economy no longer ran a trade surplus but instead a widening deficit, the dollar came under pressure and eventually came off its quasi-gold standard in the early 1970s, signalling the end of the Bretton Woods era. With the collapse of profitability of capital in the major economies from the mid-1960s, everybody fought for trade share, devaluing their currencies. The IMF had to try and force various governments with financial crises to maintain fixed rates with the dollar through austerity (‘internal devaluation’). In the ensuing neo-liberal era from the 1980s onwards, trade tariffs were reduced to benefit America, but ‘globalisation’ of capital led to the rise of Japan, Korea and China as competitors in world markets to the US and Europe. The Keynesian dream of ‘two great nations’ organising global cooperation and a new world economic order was no more than that: a dream. The chart below shows that American exported capital globally in the post war period. But eventually American capital had to fund it not by a trade surplus, but by borrowing. American companies continued to invest abroad profitably and Japan and Europe recycled their trade surpluses into dollar bonds, thus keeping the cost of borrowing cheap for America. This was a great way for the US to sustain profitability through its dollar hegemony. 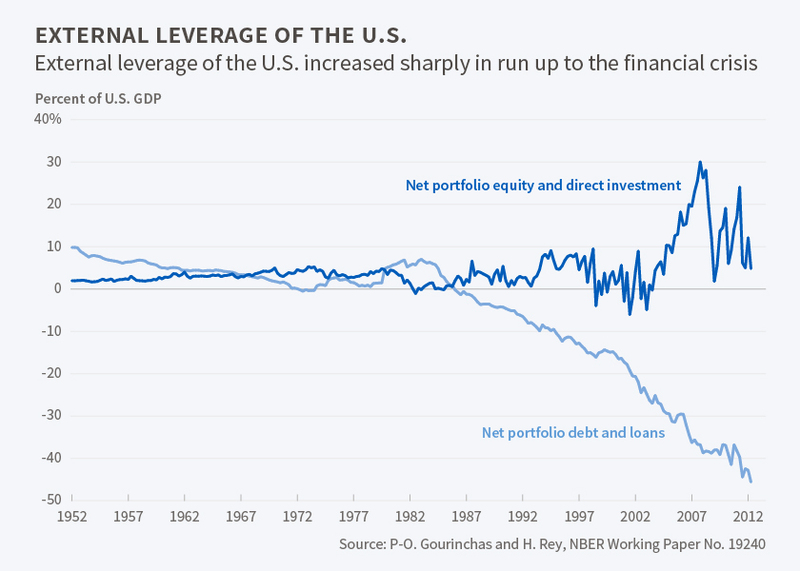 “Essentially, the US economy has been able to borrow cheaply from the rest of the world, and then invest those funds in companies around the world. The average return on equity over sustained periods of time is higher than the return on debt. The gap has been between 2.0 and 3.8% per year since 1973.” Pierre-Olivier Gourinchas discusses this pattern in “The Structure of the International Monetary System,”. The reality that is not recognised by Keynesian economics when it considers the world economy is that, under capitalism, development may be ‘combined’ (globalisation, trade pacts etc) but it is also ‘uneven’ (inequality, credit monopoly etc), as the example of Bretton Woods shows. The Guardian authors want a new kind of Bretton Woods along the lines of the ideas of Keynes, they say. This is an illusion under capitalism and one that even Keynes did not hold himself. This article was originally published on his blog on 23 April 2016.